Using stones in architecture goes almost as far back as the beginning of time and by looking at building build with stone it is totally understandable. Unfortunately using just stonework to construct a building is expensive. This is probably a big reason why stone is only used on the surface of a building to give a different quality than just a plain brick or painted wall would have. This house was designed by architects in Russia and the clever design work creates a dynamic not seen in many buildings. Brown and white and green is used to create a calm atmosphere without giving up any artistic or natural quality this house possess. Looking carefully one can see that this house is actually two buildings, the main house and a guest house. Gardens is used to forma a unity between the two different buildings, while differing from each other. 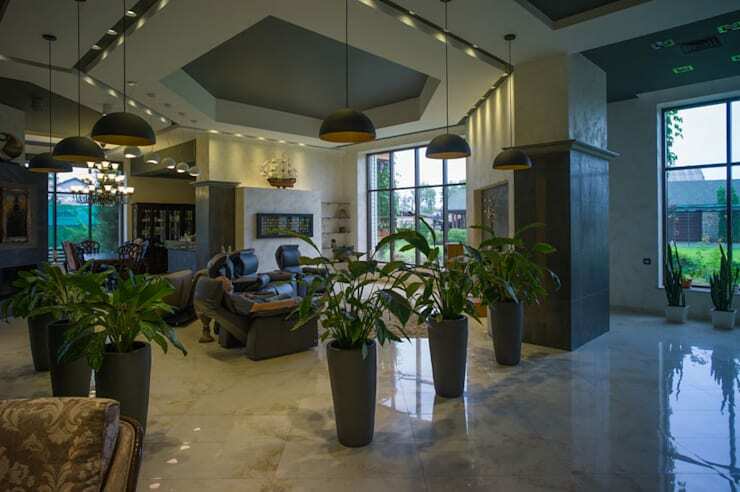 The use of beautiful luscious gardens put this place in a different category and combined with the interior plants are there perfect harmony between the interior and exterior. This side of the house is a more rectangular form, without looking like a block of cement was dropped. The white walls is texturized, while the brown door is smooth. 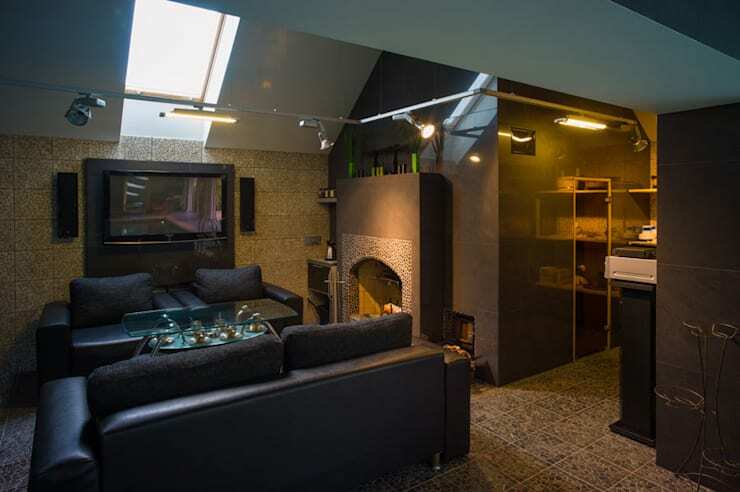 The dark glass panels lets in an abundant of sunlight, to warm and illuminate the interior. A framework is put against the side of the house for vines to run up against. The vines and other plants shading the house provides a welcome natural cooling system, without running the electricity bill that comes with a place this size. The plants and the pond gives a natural feel next to the stone pathway, which ties everything nicely together. Nothing makes a house more a home than a wonderful garden where you can just kick off your shoes and relax after a long hard day at work. 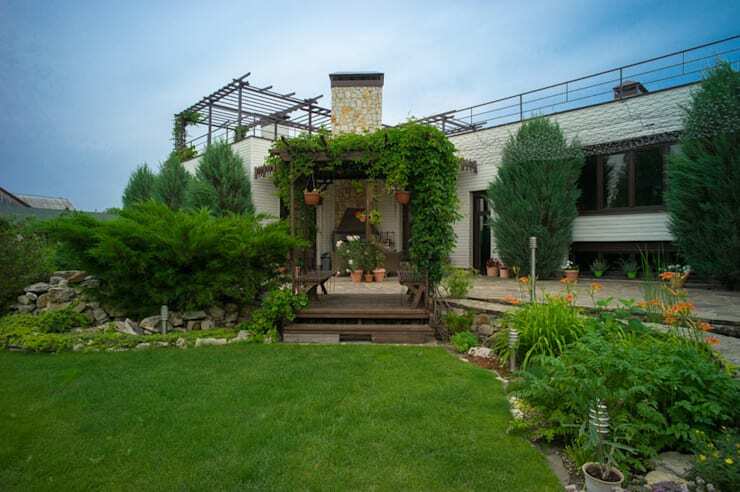 The green lawn goes up to the veranda and the arch, which is overgrown with vines. The trees and plants next to the veranda gives privacy, but doesn't hide the house from view. There is only a partial view of the house , but the green and the light colour of the house as well as the splashes of the orange flowers, compliments each other in a way to create serenity. For more beautiful garden idea, have a look at Lush Garden Design's projects. To add to the privacy of a building like this, a big brown gate is added. A stone wall is put around the property, with a small pedestrian gate. A higher building, that gives the idea of a tower is added that could be perfect for a security hut. A part of the house can be seen over the wall. The white is in stark contrast to the earthy tones of the stonewall and the brown of the gates. The little bit of the house that can be seen gives one the idea about the massiveness of the house. Chimneys are on both ends of the roof, which reminds us that there is either a fireplace or an interior braai area. The roof also doubles as a veranda where you can have nice family meals or parties. A wide singles tory building standing in the distance, overlooking the greenery that is the lawn and the fishpond in the front, creating a scenery of peace and quiet. 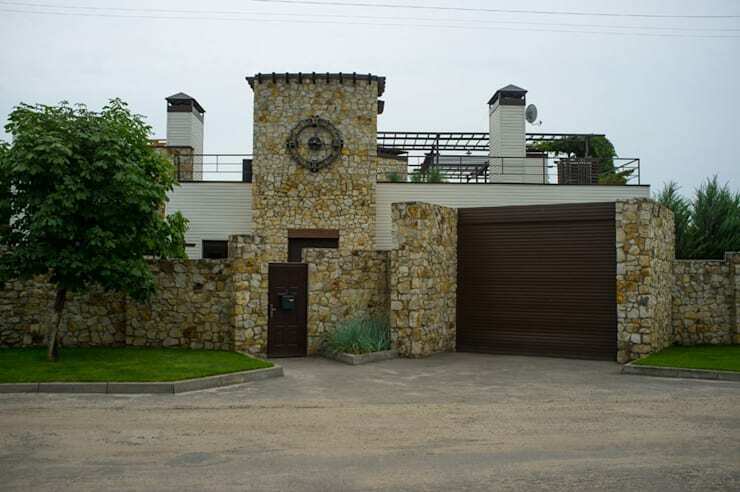 This part of the house, gives an impression that it belongs on a farm or beautiful estate. 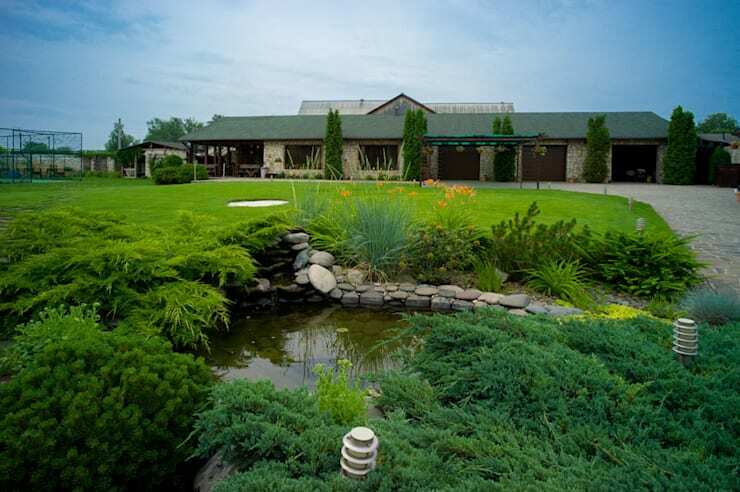 A patio on the left side invites people in, and although the house is a beige with darker brown garage doors and in contrast with the greenery, does it still blend in. Clever placement of cypress trees between the windows and garage doors and the green roof, camouflage the house, but doesn't make it disappear from view. The white and brown from the outside is being used in the inside as well, to form a nice unity. The divider between the stairs and the rest of the house is filled with plants, which breaks with the browns and subtle changes in white. The round golden plant holders gives a splatter of embellishment to the room. Four bowl-like hanging lamps illuminates the plant with a soft yellow glow. The lamps are also in stark contrast against the rectangular forms of the divider, stairs and yellow-golden piece of art. The yellow glow gives a warm felling against the cold floors. Going with the theme of earthy colours, the living room is no exception. By bringing the hexagon into the design on the ceiling the room get immediately a different feel than it would have with a normal ceiling. The room is illuminated with tiny ceiling lights as well as the bowl-like lamps, situated over the three pot plants. The big windows let in natural light, but also gives a view to the beautiful property. Apart form using the hexagon and grey colour on the ceiling to give dimension, the walls is also used, by dividing it in a lighter and darker parts. The floors that is used in the open plan design makes the room appears bigger and even more open. The openness is further emphasised with the minimal furniture and plants, put in strategic places. 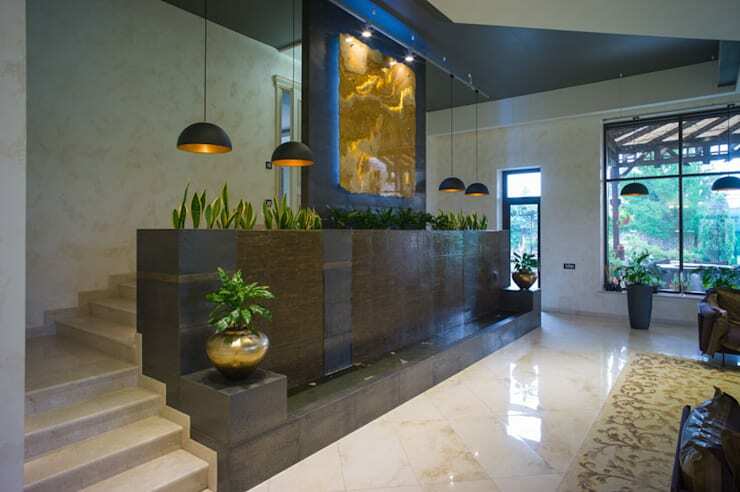 The plants also divides rooms, without having to use physical walls. The TV room is made cosy with a comfortable leather couch and two chairs around a coffee table. The coffee tale is in contrast with the leather couches, the brown tiles and shiny brown walls, yet fitting in perfectly with each other. Light fixtures is attached to open piping and a skylight illuminates the room during the day. A small fireplace on the one side gives warmth for cold winter nights, when you're curled up in front of the TV. The fireplace is made from texturized material instead of smooth tiles like the rest of the wall. The wall underneath the window is also a different type of finish in a lighter brown. Although everything is different browns, the room doesn't become depressing. One of the rooms in this house that has a different kind of lighting fixture is the beautiful chandelier that is used in the dining room. Instead of using lights that is in the ceiling, this piece that is hanging low, are closing the open space between the ceiling and the floor. 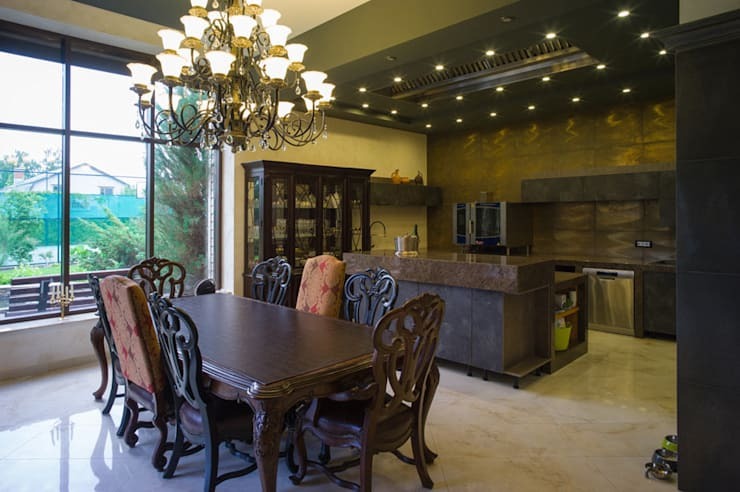 The dining table is dark woood with ornate patterns on the chairs and table legs. The two different chairs make the dining set more pleasing to the eye. Next to the dining room is the kitchen, also in the same dark wood and counter tops. A dark wooden and glass display cabinet is set against the wall next to the big windows, perfect for alll that fine china. The kitchen in contrast to the dining roorm rather has ceiling lights and during the day supplies the big window sufficient natural light. 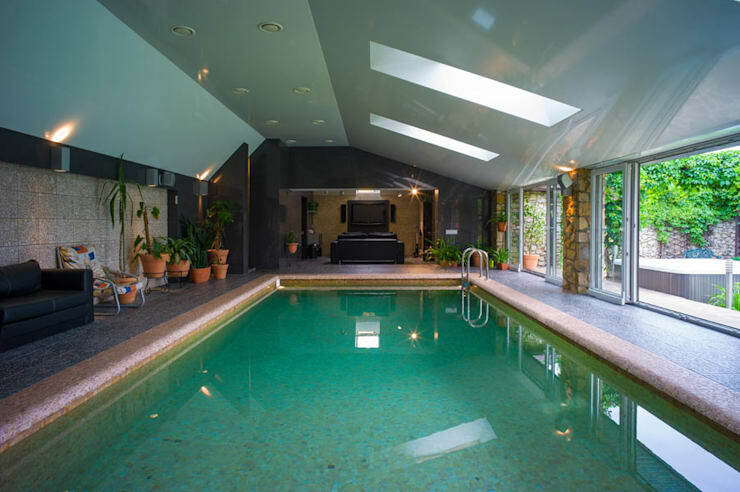 A beautiful, relaxing garden and an indoor pool to die for is definitely ways to go in the relaxation department. The large pool is also a great way to exercise without having to leave the comfort of your home. Add to he equation of relaxation is the large glass doors and sky light that lets in natural light as well as pot plants scattered across the room. The open plan design between the indoor pool and the TV room, adds an illusion of an even taller room than it would with just the pool. 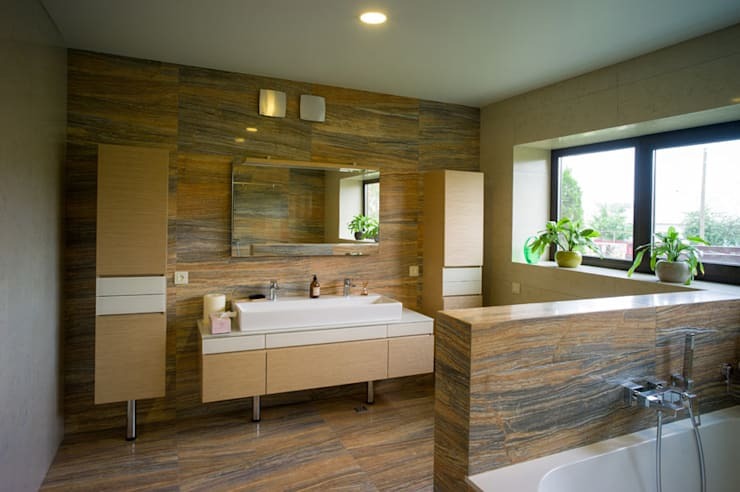 Big rooms have the habit of attracting the intention and that is even more true for a big bathroom, seeing that this is a space that is way to many times neglected or under utilised. 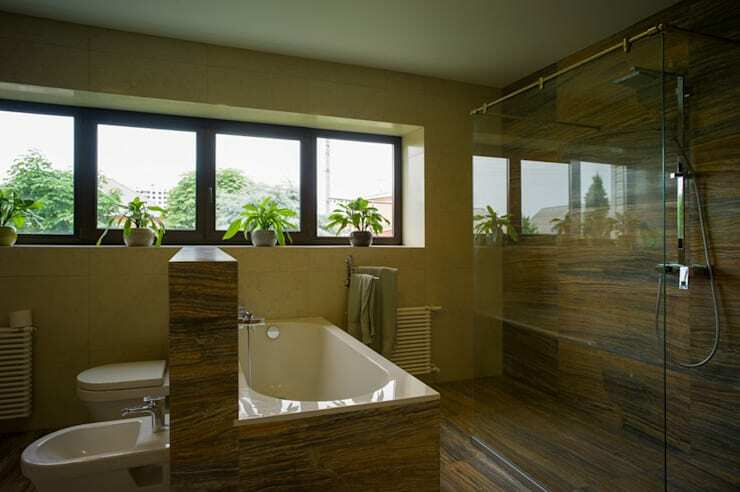 This bathroom forms a unity with the rest of the house and the outside with the earthy colours, but is different wit the patterns off the walls and the floors. The cupboards under and next to the sink is smooth light brown and white, breaking from the darker walls and floors. The cupboards are also supported by circular metal legs, that ties in with the big mirror again. To illuminate the bathroom, big ceiling lights and two wall lights above the mirror is used. The other half of this bathroom is just as impressive as the previous half. With a half wall dividing the bath and shower spaces from the rest is of the room, is there the advantage that you don't need to look into a toilet when taken a relaxing bath or hot shower. The shower is a walk-in shower, separated with only a glass of sheet, while the big white bath stands out against the brown surroundings. Other features in this bathroom is the towel rack and the wall mounted heater next to it. Even here the outside is brought inside with big windows, bathing the room in sunlight but not giving upon privacy. The plants in the window brings a bit of colour into the room. Using brown or earthy colours doesn't need to be boring. With the use of plants, big windows and clever design work a place like this is transformed from a dull looking space into a beautiful place tying in with nature. Did you like this house? Tell us why in the comments!